It is our 5 year anniversary! Join us for a special solidarity day March 10th and our first ever fundraiser April 27th! Help us sustain the fight and join us in our first ever fundraiser. Save the date! More info coming soon. Join us 6/26 to support Maru's Court Hearing and to put ICE on Trial! At the end of December, immigrant activist Maru Mora Villalpando received a letter from ICE calling for her deportation as retaliation for her work against detentions and deportations. Her last court was postponed for Tuesday June 26th. Maru will go before an immigration judge for the second hearing in her deportation case. Typically, people have three hearings before they are issued an order of removal or are detained. Maru is a fierce and tireless truth-speaker who has put her life on the line in the fight to end detention and deportation. She is clearly being targeted for her powerful activism, and she intends to continue fighting. We are asking you to be there with Maru outside the immigration court building before and during the hearing. Please bring your signs ("Defend the Defender", "ICE Hands Off Maru” "Chinga la Migra" "Abolish ICE") and your friends. Come early at 12:30 to hear from Maru before she goes inside. Starting at 1:00, a tribunal against ICE will take place outside the building while we wait for Maru to emerge and update us on what happens in court. "As ICE takes me to court, I'm taking them to the People's tribunal in our community"
A fines de diciembre, la activista e inmigrante Maru Mora Villalpando recibió una carta de ICE empezando un proceso de deportación en su contra como represalia por su trabajo contra las detenciones y deportaciones. Su última corte fue pospuesta para el martes 26 de junio. Maru se presentará ante un juez de inmigración para la segunda audiencia en su caso de deportación. Por lo general, las personas tienen tres audiencias antes de que se les expida una orden de deportación. Maru es una guerrera e incansable oradora de la verdad que ha arriesgado su vida en la lucha para terminar con la detención y la deportación. Claramente está siendo atacada por su poderoso activismo, y tiene la intención de seguir luchando. Le pedimos que esté allí con Maru afuera del edificio de la corte de inmigración antes y durante la audiencia. Por favor traiga sus letreros ("Defendemos a la Defensora", "ICE No te metas con Maru" "Chinga la Migra" "Abolir a ICE") y a sus amigxs. Venga temprano a las 12:30pm para escuchar a Maru antes de que ella entre a corte. A partir de la 1:00pm, un tribunal contra el ICE se llevará a cabo afuera del edificio mientras esperamos que Maru salga y nos actualice sobre lo que sucede en la corte. "Cuando ICE me lleva a corte, también los llevaré a ellos al tribunal del pueblo de nuestra comunidad"
Did you follow our recent actions with the Mijente #ChingaLaMigra tour? We blocked the roads outside the ICE building downtown Seattle bringing attention to theepicenter of deportations in Washington State. If you haven't already, sign the petition to demand Martin Selig Real Estate stop renting office space to Trump's deportation forces! #ChingaLaMigra Kicks Off Tour in Seattle! For more related press, visit our Press page. Watch the #ChingaLaMigra kick off episode of Seattle here! Activists with Northwest Detention Center Resistance and Mijente locked down outside of 1000 2nd Avenue in downtown Seattle, Washington, calling attention to the building’s role as Washington State’s deportation epicenter. The building, owned by billionaire developer Martin Selig, houses regional offices for ICE’s Homeland Security Investigations and Office of Chief Counsel, regional offices for Customs and Border Protection, and the Department of Justice-controlled Seattle Immigration Court. Sign the petition to demand Martin Selig Real Estate stop renting office space to Trump's deportation forces! The lockdown is part of the launch of the “Chinga La Migra” organizing tour to tell the story of what the deportation crisis under President Trump looks like in real time, and amplify the efforts and stories of resistance. Immigrant activists Maru Mora Villalpando of Northwest Detention Center Resistance herself faces deportation in the Immigration Court housed at 1000 2nd Avenue due to her anti-ICE activism. ICE received Mora Villalpando’s information directly from the Washington Department of Licensing. She stated, “This building serves as the epicenter for the deportation pipeline in Washington State. Seattle presents itself as a sanctuary city, while several floors of this downtown building house the offices of the very people tearing our communities apart. Trump's cops have no place in our city, and we want them gone. 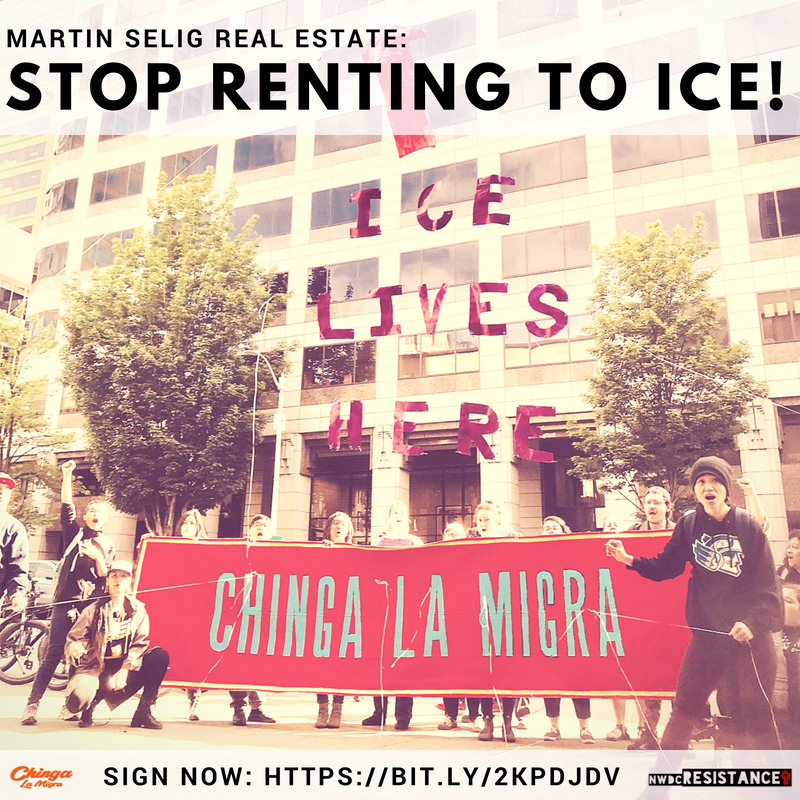 From 1000 2nd Avenue in Seattle to the Northwest Detention Center in Tacoma, we say, ICE out of Washington State.” Protesters are demanding that Martin Selig Real Estate stop renting office space to Trump’s deportation forces. Donate to the Northwest Detention Center Resistance by clicking here! Sign our petition to stop Mele’s deportation! Undocumented loved one and father of three young children Melesio Morales Mata was detained by Immigration and Customs Enforcement (ICE) this week after his lawyer presented a stay of removal at his monthly check-in with ICE. Join us for a week of hunger strike solidarity by observing a one day hunger strike anytime today, Monday February 12 to Sunday February 18. For one week we will do a rolling hunger strike in solidarity with the hunger strike and work stoppage currently happening in the Northwest Detention Center as well as the harsh retaliation they are receiving from Geo. We invite you, whether individually or with an organization, to join us by choosing one day of the week (or more) and going on hunger strike. We are doing this to honor the current hunger strikers’ demands inside, and to demand an end to detention and an end to deportation. Activists who speak out against ICE and the deportation machine are targeted by the state, whether inside the detention center or outside. When people detained at NWDC go on hunger strike to demand better conditions inside and an end to deportations, GEO Group retaliates with isolation, threats of force feeding, physical and emotional abuse, and more. When people on the outside demand freedom of movement for all and take actions in line with those demands, the state spies on us, our families, deports us, arrests us, intimidates us. But we are not alone. Inside or out, we will continue to work towards a world with no detention and no deportations. We will continue to work towards a world where freedom of movement is granted for all people. Join us and pick a day between February 12 and February 18 to strike in solidarity with the activists detained at NWDC. 1 - Email us at resistenciasolidarity (at) gmail.com and tell us what day. 2 - Take a picture of yourself, or your organization, with the signs attached (or make your own) and post them to your social media! Tag us! 3 - Write a message or letter of support to the strikers inside. We will send them the messages and photos. 4 - Download our most recent People’s Tribunal findings and use them as talking points to chat with people around why you’re on hunger strike. Visit our Press page to view the most recent information on the breaking hunger strike at the Northwest Detention Center and the Findings to our recent People's Tribunal. The Seattle office of Immigration and Customs Enforcement (ICE) has served a “Notice to Appear,” to Washington-based community activist and mother, Maru Mora-Villalpando. This means that ICE has begun deportation proceedings against her. Here are a few actions you can take now: SIGN THIS PETITION to rescind the deportation order, donate to Maru's Deportation Defense Fund, join us for our 3rd Annual People's Tribunal on February 4th. You can read more about it here and watch an interview with Maru here. Watch our newest 11 minute documentary! Hunger Strikes: A Call to End Immigrant Detention from Resistencia NW on Vimeo. While we all plan for next steps for #DACA, we ask you to remember the dozen people still on #hungerstrike in NWDC. Read our press releases and learn more about the hunger strike happening now at the Northwest Detention Center. Follow our Facebook for more info. Farmworkers strike after the death of a fellow worker in Sumas, WA. August 10th, 2017: Happening now! Camp Zapata - a camp of guest workers via the H2A program & community members - are organizing to demand accountability for their fellow worker's death, Ernesto Silva Ibarra, as well as to demand pay of their own owed wages and renewals of their expired visas for which the company farm Sarbanand Farms is responsible for. Follow Community to Community for updates. Fourth Hunger Strike of 2017 Happening Now! August 9th, 2017: 20 people inside the Northwest Detention Center (NWDC) started another hunger strike, the fourth this year alone, demanding to be released from segregation and for all people detained be released to their families and communities starting with people that are not deportable, those that should be covered under the Convention Against Torture, and those that have waiting for a response on their case for more than 1 year. Read the press release here and follow updates on our Facebook! July 20 - Justice for Cynthia! Cynthia Vanessa Iraheta Lopez is a mother of 2 children, a 3-year old and a 9-year old, ICE wants to separate them by deporting Cynthia! Originally from Honduras, she’s lived in the U.S. for years. She’s a part of the Seattle area community. Unfortunately, to the racist, xenophobic Trump administration and the U.S. government, she’s “illegal” and must be deported. For years Cynthia has reported to DHS/ICE as instructed including on May 11, 2017, where she was told to report to BI Incorporated, a private contractor for DHS, for possible removal to Honduras. Due to community support and pressure, her removal was delayed while ICE reviewed the stay of deportation presented by her lawyer. Unfortunately, in an act reminiscent of a police state, she has been forced to wear an ankle bracelet so the government can monitor her whereabouts at all times. For this next check-in ICE has threaten Cynthia with being the last one, they want to separate her from her children! We call on the community to stand against family separation because it is cruel and unusual punishment. She has called on the community to support her on the date she’s to report to the Department of Homeland Security and possibly be deported from the U.S.
What can you do when you know your rights, but the US government doesn't respect them? Join the Northwest Detention Center Resistance for a short documentary screening and discussion of the 2014 and 2017 hunger strikes to protest human rights abuses at the Northwest Detention Center in Tacoma, Washington. Support the Hunger Strikers! June 20 Call To Action! We will be camping in front of the Northwest Detention Center (1623 E J Street, Tacoma, WA 98421) 24 hours a day through the end of the week. Bring yourself and whatever you need to be comfortable – chairs, food, water, music – and join us in calling attention to the immigration system we all share responsibility for. The Northwest Detention Center is terrorizing immigrant communities and communities of color – not just in Tacoma, but also in Seattle, Bellingham and even Boise. The City of Tacoma can and should shut down this center. There are many legal avenues: revoke the business license due to GEO’s failure to comply with health standards; conduct unannounced inspections inspect the facility’s kitchen and laundry facilities (rather than notify GEO in advance); and/or revise the municipal code to make all detention facilities meet residential zoning standards. GEO would have to comply or shut down the facility. Please sign and share the petition at https://action.mijente.net/petitions/close-the-northwest-detention-center-release-immigrants-on-bond, which we’ll have up until Tacoma City’s Emergency Ordinance to prevent the NWDC’s expansion expires on September 9, 2017. If you’re not local but you want to support us, you can fast for one day, or even just one meal. Please write a note, draw a picture, or take a selfie and tag #NWDCResistance on Facebook – tell folks on the inside why you stand with them! On Monday June 19, Maru Mora Villalpando, member of NWDCR, started a hunger strike to call attention to the plight of up to 1,600 immigrants held in detention suffering human rights abuses at the Northwest Detention Center. On June 15th 2017 at least a dozen detainees went on hunger strike to call attention to inhumane detention conditions, refusing to eat for multiple days. By June 18th, NWDCR organizers received reports that more than 25 hunger strikers are calling on GEO Group to provide edible, nutritious food, on ICE to provide fair and timely hearings, and on civil society to step up and take action for the injustices in our communities. In response, Maru Mora Villalpando is going on hunger strike, and is joined by other members of the civil society who are stepping up their solidarity. For more, read the press release here. April 2017 Hunger Strike Call to Action! 1. Call the City of Tacoma’s Finance Department and urge them to revoke GEO Group’s Business License. 2. Call ICE and demand that they meet the Hunger Strikers' Demands (see below) and that GEO Group not retaliate against hunger strikers. We have reports that strikers have been threatened with transfer to facilities away from their loved ones as punishment. ▪ Improve hygiene, including the ability to wash clothes with soap and water. ▪ Have schoolwork and other programs available to keep detainees occupied. ▪ Increase wages for working detainees. ▪ Help speed up the legal process for detainees. Other hunger strike updates 4/14/17: Seventy Detained Women Join Protest as Hunger Strike Enters Fifth Day. Download the press release on our press page here. Follow our social media for updates. Prince and Jonathan, two of over 700 hunger strikers being held inside the Northwest Detention Center. Listen to Jonathan explain why he's on hunger strike. Visit our press page here. Follow our social media for updates. Download the press release here. Follow our social media for updates. Download the Hunger Strikers Handbook Now! The Northwest Detention Center (NWDC) in Tacoma, WA is one of the largest immigration prisons in the country, with the capacity to hold up to 1,575 people. On Friday, March 7, 2014, over one thousand people held in the NWDC fought back against an unjust system by putting their bodies on the line: a hunger strike. The strike continued for 56 days and spread to other detention centers across the USA. This year, on the third anniversary of their action, we reflect on their achievements and make an abolitionist call to stop locking people up and end all deportations. Learn more and download the Hunger Strikers Handbook. On February 26th, 2017 we gathered outside the Northwest Detention Center to hold a hearing pertaining to the detention and deportation process, conditions of the detention center, and treatment of detainees. Download the hearing findings here. Darker times are coming. As undocumented immigrants and co-conspirers we are committed to continue fighting for justice and ending detentions and deportations. And we will continue to offer our hands to all other communities that will be targeted. This election was won by first attacking immigrants of color and giving permission to all the bigots to use us as a punching bag for their frustrations against the establishment. Then other communities were lined up for the punching. But all those punches and promises from the now-winner of the presidential election have already been happening to most of us. The difference is that now it will happen to the rest of the country. This moment calls for a ramping up in organizing towards an end to all deportations and detention, and collective liberation for all of us. This moment, we must unite forces and work together. We are the experts alongside many other communities of color in surviving. We are the experts in protecting each other. We are the experts and have organized for a long time. We are willing to share our knowledge of wining and resisting. We need each other. We need to fight together. Will you protect us as we will protect you? Will you be there for us when they come to get us and try to deport us? Will you organize with us? Support this work and pledge to fight alongside us and other folks targeted. Making a donation today. Become a sustaining supporter and donate $5-20 a month for the next four years. See you in the streets. Dia de los muertos is a cultural and spiritual celebration that brings together souls of our departure ones and the importance of having a quality of life for those celebrating this important Mexican festivity. NWDC Resistance and partners invite you to celebrate with us and to call for an end to detentions and deportations, without forgetting the thousands of people still detained and separated from their loved one in detention centers throughout the nation. At NWDC Tacoma, we call for this place to shut down and be replaced with a community space that commemorates life not incarceration. As DHS, under outside pressures, holds a small group of people to write a “review” of the private detention centers they use to incarcerate people awaiting for a result on their deportation process, we ask you to join us and listen to the voices of those detained, the voices that DHS refuses to listen to while making any decisions about their lives. Join us for a weekend of learning, sharing and working towards liberation of our communities of color. There will be different events and activities happening with the help of members of the Tacoma community and beyond. We remind our allies that this event will create a space of respect and intentantionally stopping any cultural appropriation from happening. We also ask that everyone that attends participate fully and engage with us respectfully. People in detention are waiting for us to take action, not only to observe without taking their call seriously. A detailed agenda will be shared later on, keep an eye on the event page. Read our solidarity statement with the people of Standing Rock Sioux Tribe and others who oppose the Dakota Access Pipeline and work for the future of our land and people. Our liberation are connected. Check out our ICE Free Zone Flyers, download them on our Press page. As we celebrate Mother's Day, we reflect on the US immigration policy that separates mothers from their families. We want to see an end to deportations and an end to detention. We want to see our families together and thriving. So NWDC Resistance teamed up with CultureStrike, Presente.org, Forward Together,and Strong Families to deliver Mamas Day Cards to Mamas inside the Northwest Detention Center. The Mamas Day Project started in 2011 to create cards that reflect the various ways our mamas and families look, including a spectrum of gender, race, income, sexual orientation, immigration status, and more. This year NWDCR teamed up with the Mamas Day Project and took those cards in to the Northwest Detention Center and delivered to Mamas inside. DUMP TRUMP, Lynden Washington Style. On Saturday May 7th, 2016 we participated in a blockade on a hot road in Lynden, Washington that lead to a Donald Trump rally. Over a dozen Latinx, Native American, and white Washington residents risked arrest blocking traffic to two main roads in Lynden, Washington during a Donald Trump Rally with “Make Lynden Coast Salish Again” banners. "As someone who has grown up in Washington, today I am putting my body on the line to stop fascism from taking over our country. Today I am fighting for my mom, for my Native American neighbors and friends, and anyone who has been the target of hatred whether it comes from Trump or the local police. The residents of Lynden today have a chance to stand with us and reject hate,” said Josefina Mora, 18, one of the participant’s of today’s action.."
For more information, read the Mijente article here. Call to Action: Justice for Angel Padilla! Angel Padilla is being detained at the NWDC without access to the healthcare his life depends on. Desperately in need of a major surgery for a cancerous tumor in his left kidney, Padilla waits in an immigration detention center that does not and will not provide adequate health care. Take action now and demand that Angel Padilla is released immediately, that he be given full access to medical files, and that his deportation be stopped altogether. Padilla is one of 1,500+ detainees in the Northwest Detention Center exposed to human rights violations on a daily basis. Many who are detained not only have health care needs that are not met, but are often put in solitary confinement instead of being provided with adequate health care. This needs to stop! 2) Sign the petition and demand: Justice for Angel! Click here to sign the petition and join NWDC Resistance and the #Not1More Campaign in sending a message to ICE officials. For press about this action visit our Press page. September 21, 2015, at the Northwest Detention Center in Tacoma, Washington, more than 20 community members locked down to prevent the morning's deportation buses from leaving the privately run facilities. The goal was not only to prevent the day's immigrant deportations, but also to protest the criminalization and scapegoating of immigrants, highlight the moral injustice of privately-run for-profit detention centers and their collaboration with the local police departments creating a road to detention, and call for an end to all immigrant deportations and detentions. Banners spread next to protesters read "Climate Justice means Ending Deportations" "Queers Demand and End to Detention" and "Not1More", speaking to how immigration is an environmental issue and issue of gender justice. "Climate change is resulting in worsening drought and super-storm conditions which displace millions across the globe. These climate refugees will number 200 million by 2050. World leaders and communities across the U.S. need to end these unjust deportations and commit to policies that stop climate change." said Jill Mangaliman, one of the protesters locked down today and executive director of Got Green. Members of TWAC (Trans and/or Women Action Camp) carried signs protesting ICE's controversial practice of placing transgender detainees in solitary confinement. While transgender women only make up 1 out of 500 detained immigrants in this country, they make up an alarming 1 out of every 5 confirmed sexual assaults in immigration detention. Participants of the day's blockade, which included Rising Tide Seattle, the Raging Grannies, and other groups fighting for climate justice, economic justice, reproductive justice, worker rights, and more, vow to keep returning to the detention center for future actions as long as unjust detentions and deportations continue. Spread the word & share! La Resistencia shared a post. Here's our statement regarding ICE Air presence at King County Airport also known as Boeing Field. Read the full statement in La Resistencia fb page. Ahead of today's public release and panel about deportations flights in #Seattle #KingCountyAirport, here's the report done by Center for Human Rights at UW. Honored to partner with them. We demand concrete plans for ending deportations flights in our state. On Tuesday morning, one day before the release of a report by the UW Center for Human Rights documenting the extensive use of King County Airport to facilitate detention and deportation, King County Executive Dow Constantine announced the county’s intent to end their support of deportation flights. The imminent release of a report that chronicles the use of a King County facility in Trump’s deportation terror may have created a public relations emergency for the County. However, the real emergency, the detention and deportation of our community members, continues unabated. Just yesterday, under the County's watch, yet another deportation flight took off from King County Airport. This is the emergency that must be faced - King County leadership must stop collaborating with Trump’s deportation regime. 1. Commit to a concrete plan, with a short timeline, to end the leases with charter companies running ICE’s deportation flights. The county should release a concrete plan to terminate ICE Air leases immediately, rather than at the time of lease renewal. Executive Constantine failed to mention that the primary lease for the ICE Air flights was just renewed, and won’t end for 35 years. We call for the County to end all leases within 35 days - a timeline which matches the humanitarian emergency which continues to unfold at King County Airport. 2. Commit to full transparency on details of ICE Air flights in and out of King County Airport. As the UW report points out, these flights are easily identified by a specific call sign. Beginning immediately, and on a weekly basis, the County should publicly share all available information about ICE Air flights in or out of King County Airport. 3. Commit to denying future permits for expansion of ICE Air. Modern Aviation recently purchased Clay Lacy, the company that runs the flights for ICE Air at King County Airport. Modern Aviation has revealed plans to expand their operations at King County Airport, and will require building permits in order to do so - permits that King County should deny unless Modern Aviation agrees to stop doing business with ICE. King County should immediately make public any request for permits by Modern Aviation, and do everything in their power to end the County’s lease with the company if Modern Aviation continues to work with ICE. Records obtained by Syracuse University show that San Diego County has one of the highest rates of ICE community arrests; those that happen at homes, work or on travel. Our 5 Year Anniversary Fundraiser is this Saturday! Our 5 Year Anniversary Fundraiser is exactly one week away! Join us for good food, music, and celebration. Get your tickets today and invite a friend!! The Puyallup Tribe remains in a stand-off with Puget Sound Energy, the City of Tacoma and the Liquid Fracked Gas plant on our estuary. 17 Washington State Tribes and 18 human and civil rights groups are calling for immediate action to protect the Tacoma Tideflats and community at large. Footage courtesy of The Puyallup Tribe, Austin Smith, and Native Daily Network. Native Daily Network's film, "Ancestral Waters," is the story of the Puyallup Tribe's fight for their treaty, their water, and their way of life. ✊🏾 another victory against immigration detention expansion out of New Richmond, WI! Don’t forget trump said he would pardon McAleenan if he breaks the law to enforce the regime’s immigration hard line. “In his role overseeing CBP, McAleenan had a direct hand in carrying out Trump’s orders related to border security. He managed a $13 billion budget and over 60,000 employees. In other words, he ran the largest law enforcement agency in the country. CBP placed 240,000 immigrants in ICE custody last fiscal year. Despite recent upheavals in the Trump administration, private contractors profiting from the detention of immigrants have little to worry about. Chicago’s gang database was searched 32,000 times by federal immigration agencies, according to the city’s inspector general. DHS’ intel chief says the immigration enforcement agency is now reaping the benefits of extra intelligence ‘collection’—and civil libertarians are concerned.